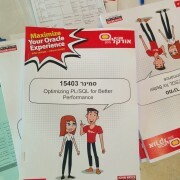 As I said in my earlier post about Oracle Week 2015, this is one of the biggest database related educational (non-sale oriented) convention in Israel. None of the session is designed for selling any products (but consultant use it to showcase their abilities hoping to sell some professional services :)). Yesterday was my second daylong session in this convention this year . This time we talked about advanced features in PL/SQL and some new features of Oracle 12c. #PLSQL teaser: can you build a package that compiles w/o error, spec contains >1 procedure, but none of them can actually be executed? The question sounded simple: can you build a valid package with header and body with more than one procedure – that can compile but can never run. That was a really interesting question and I found myself thinking about it while working. Since it is really had some good things we could learn from it, let’s go over my thought process and get to know this unique PL/SQL behavior.